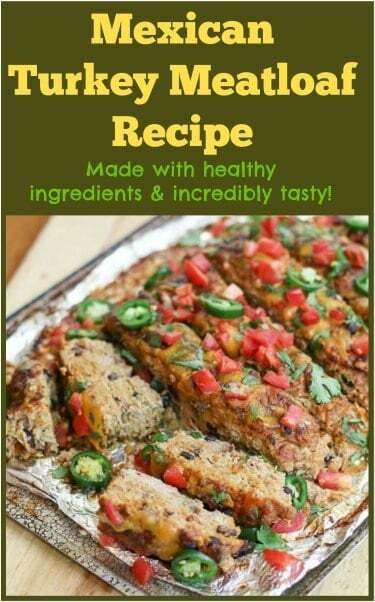 This Mexican Turkey Meatloaf Recipe is full healthy ingredients that make it tasty and spicy. 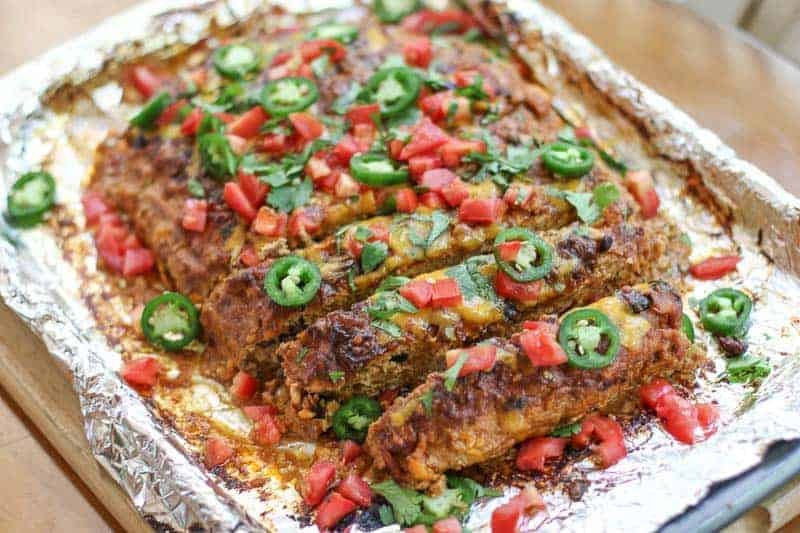 If you like a little spice, you will love this Mexican Turkey Meatloaf. While it is a healthy turkey meatloaf filled with healthy ingredients, the flavor combination will amaze you. It also makes a great meal prep idea. Have you made a healthy turkey meatloaf before and found it bland and boring? 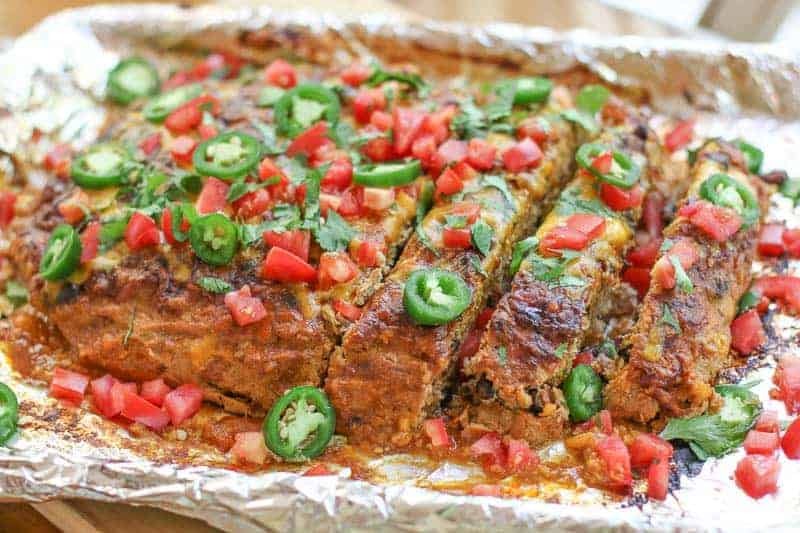 Well, you didn’t try this Mexican Turkey Meatloaf recipe…. I flavor this one with green chiles, salsa, taco seasoning, beans, and onion. Then I top it with enchilada sauce and cheese. The result? GENIUS! I know my pictures are not the best. It is hard to make meatloaf pretty… so DON’T JUDGE THIS Mexican MEATLOAF by the picture. Just take my word that this is some good stuff if you like a little spice. 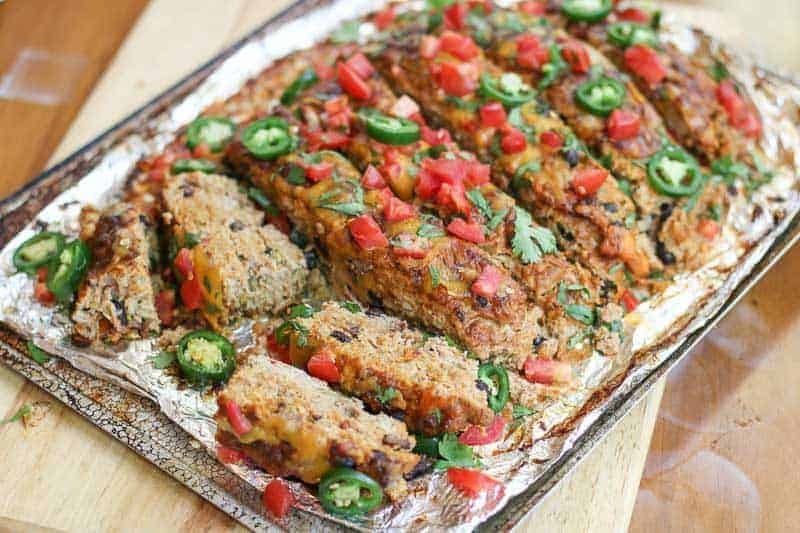 My Easy Mexican Quinoa Recipe or my Jalapeño, Cilantro, and Lime Brown Rice make perfect side dishes to this meatloaf. Just throw in a vegetable side and you have one AMAZING, FLAVORFUL meal! I try to pack him healthy lunches for work. He was eating at restaurants every day for lunch and it was making him gain weight. My meal prep has been the perfect solution. My meals are all healthy and wholesome and ready in the freezer. We have been really successful with it helping him eat better. Plus it saves a lot of money. 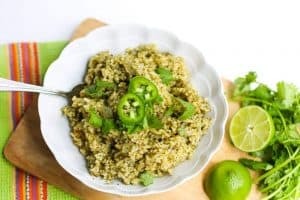 The Mexican Quinoa and Jalapeño, Cilantro, & Lime Brown Rice freeze well also if you are looking for meal prep ideas! In a large mixing bowl, combine turkey, chiles, beans, taco seasoning, salsa, egg, onion, and oatmeal. Form a large loaf and put in a 9x13 baking dish. Bake for an additional 45 to 1 hour until fully cooked. Allow to rest 10 minutes before slicing. 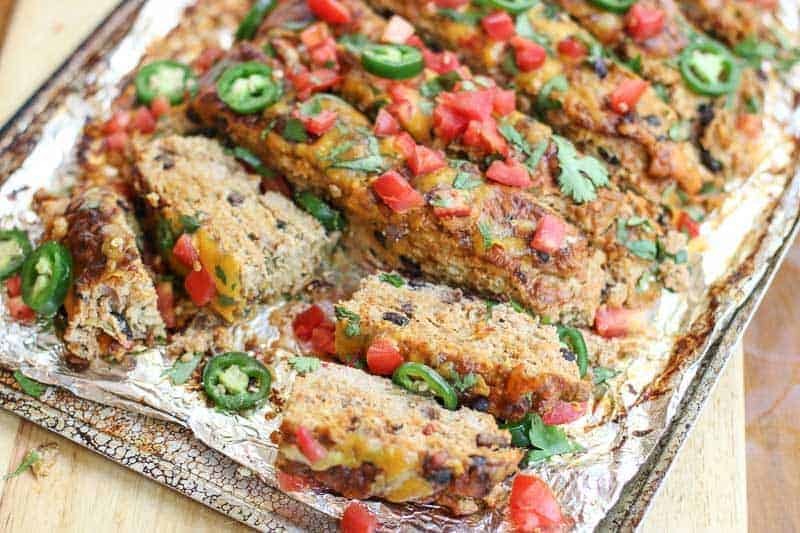 I love that this is not only tex mex but also a healthier version of meatloaf. My husband LOVES meatloaf but I hate to make it too often because it’s just so fatty and sugary. I’m definitely going to have to give this a try! Absolutely love this meatloaf. I haven’t made any in ages, because I just haven’t found a really flavourful recipe… until now! Meatloaf with Mexican flavors? I’m in! This meatloaf looks so delicious! I love that you add black beans and salsa to the mix. I can’t tell you the last time I made meatloaf, but this one is going on my list STAT. Ooooh wow! You’ve made one of my favorite comfort foods even better with these Mexican flavors. Love that you added black beans to the mix, too! your pictures are amazing! Flavors in this recipe sound interesting! 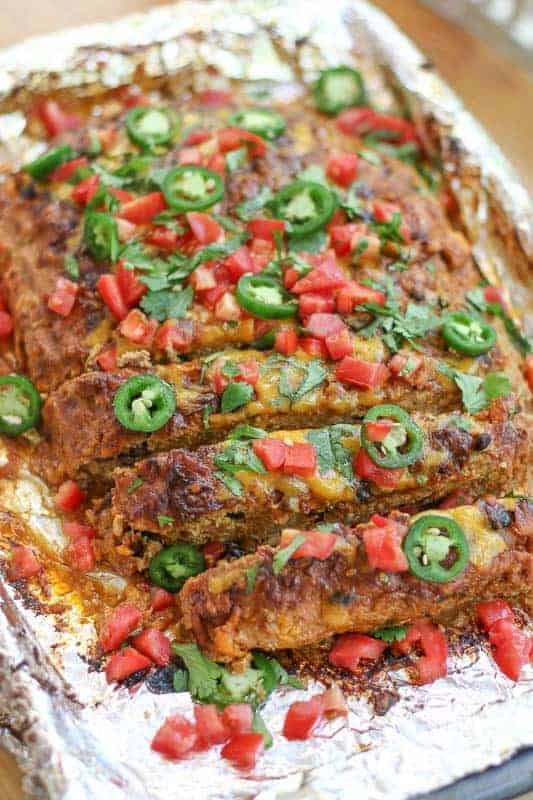 I’m loving this idea of a jazzed up meatloaf – the more jalapenos, the better! What do you mean your picture isn’t good? Girl…it’s GOOD. ..mouth is watering! Bookmarking this one for my hubby! Lot’s of zing in this little dish! Oooh! 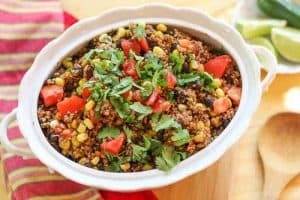 I love meatloaf, but I have never done a tex-mex version of one before! Love that you used turkey, too! I will definitely be giving this a try! I’ve never added Tex-Mex flavors to my meatloaf before. It’s such a good idea and I’ll have to try it out on my family!